From Salsa, Relish, Peppers, Cheese Sauce and Barbecue Sauce. ​SUCH AMAZING FLAVORS AND SELECTION! ​their products just about anywhere! 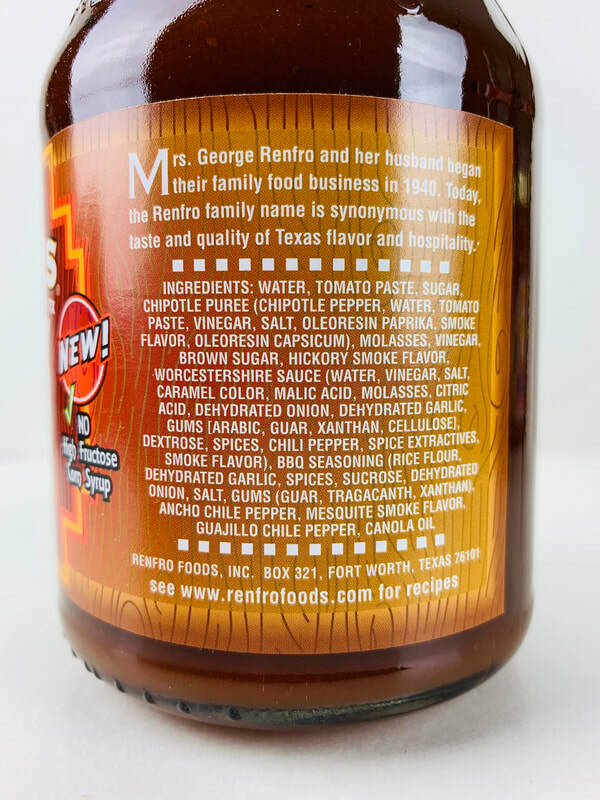 CHIPOTLE BARBECUE SAUCE from MRS.RENFRO'S.. ​ WOW!!! This BBQ Sauce is fantastic!! The flavor pops with a smokey sweet rich tomatoey molasses mixture, that bring back the traditional style BBQ flavor that everyone will love. The addition of the Worcestershire sauce and vinegar adds just the right amount of bite with a little sting coming from a . little chili pepper. What a great BBQ sauce for sure. Trust me when I say get this sauce. Your ribs, chicken, pork or anything you want will be amazing. 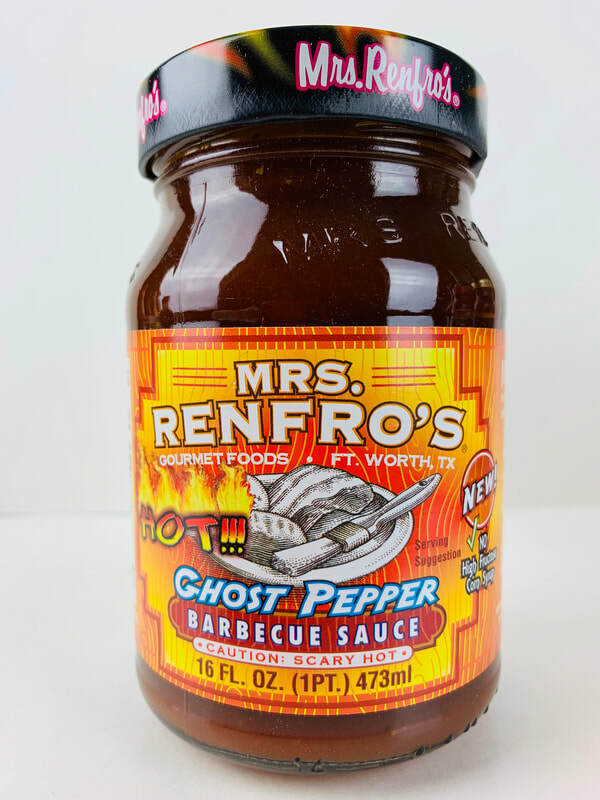 GHOST PEPPER BARBECUE SAUCE from MRS.RENFRO'S.. ​Turn up the heat and say WOW AGAIN! With basically the same flavor as their CHIPOTLE BARBECUE SAUCE this comes across rich and flavorful, BUT with one addition... The HEAT. The addition of the ghost pepper really puts a fire in your mouth and on your lips. Once again a fantastic mixture of flavor and heat to turn your barbecuing on its head. Get grilling and serve up both flavor and heat that any chili head will love! 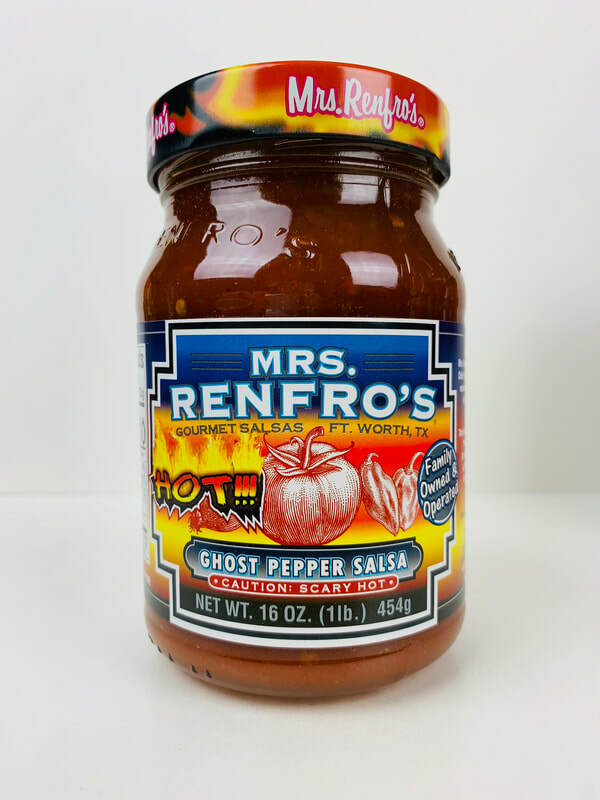 GHOST PEPPER SALSA from MRS.RENFRO'S.. This salsa starts out with the same great tomato taste as their REAP THE HEAT SALSA, with just a few little differences. 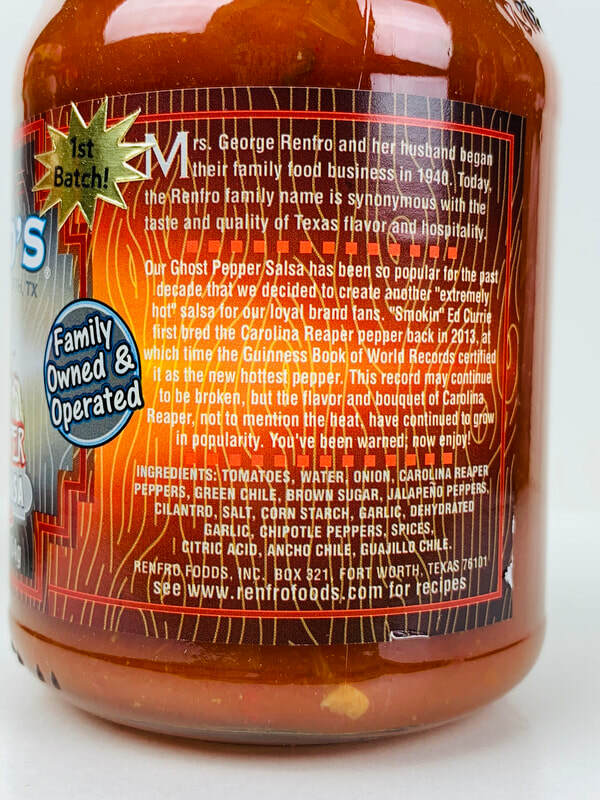 This is an awesome jar salsa even for the chillheads out there, because of the great flavor and heat. The flavor pops with jalapeño, chunks of onions, green chile, a splash of vinegar, salt, Ghost, Guajillo, Chipotle and Ancho peppers. Lots of garlic, cilantro and mesquite smoke flavor. This is a pepper lovers salsa for sure! 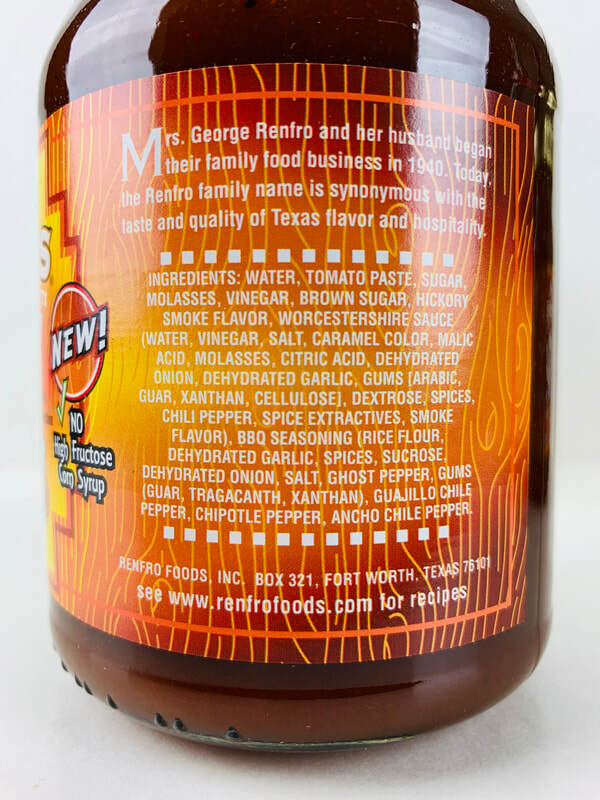 Like the label says it is a "Gourmet Salsa" and the flavor proves the label right. Once again dig in and enjoy. 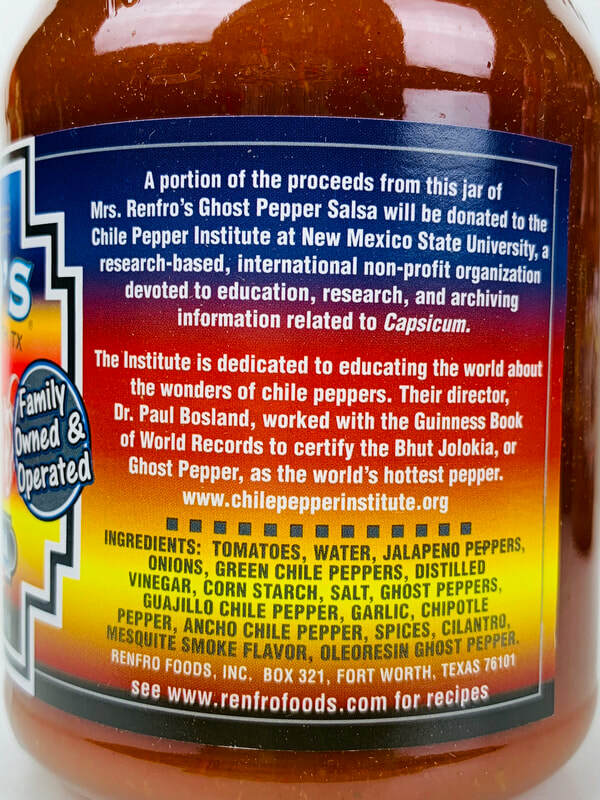 The heat from the Ghost pepper will sneak up on you and keep burning as you go in for more. Great Job!! Just like all great salsa dig in with chips, use as a marinade for beef or pork, add to you salad and of course all Mexican foods, from taco, nachos and so much more, Your going to love it! 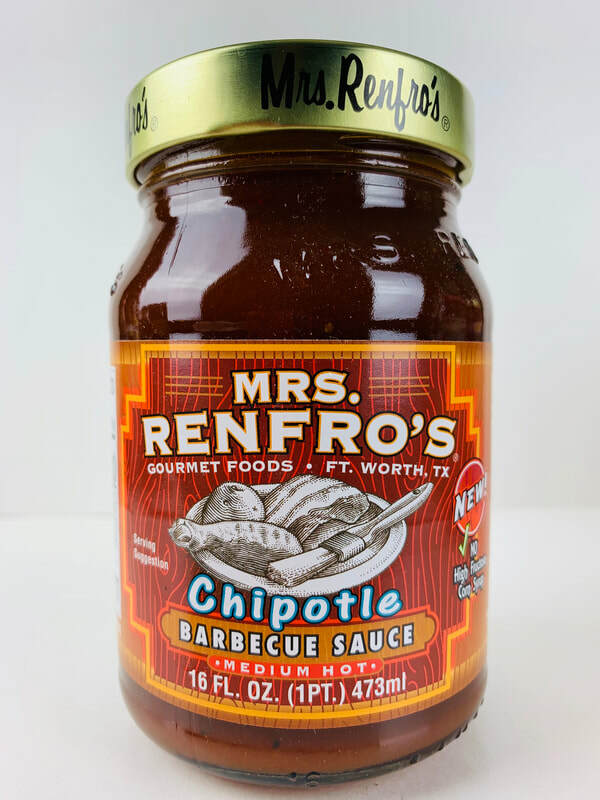 I can't wait to dig into more of Mrs.Renfro products. 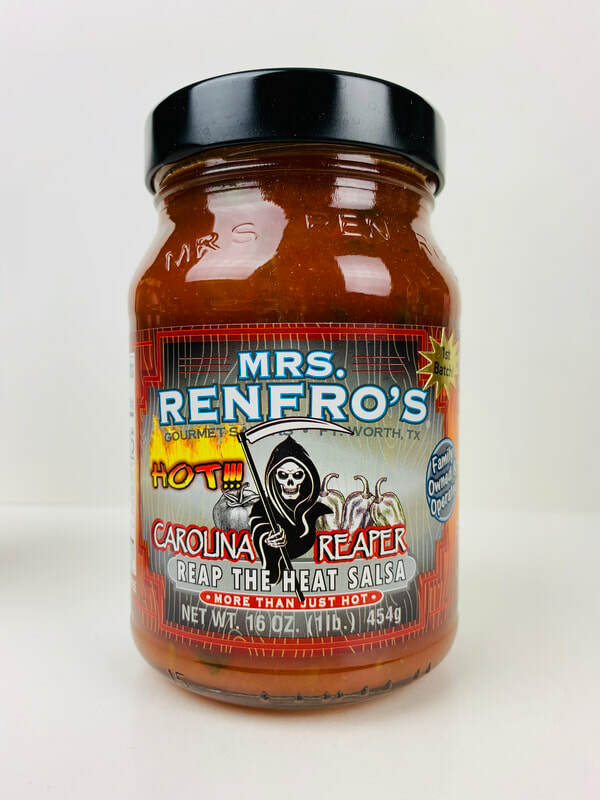 CRAFT BEER SALSA from MRS.RENFRO'S.. ​As soon as you pop open the lid, it's aroma fills the air from all the fresh tasting and crunchy vegetables. 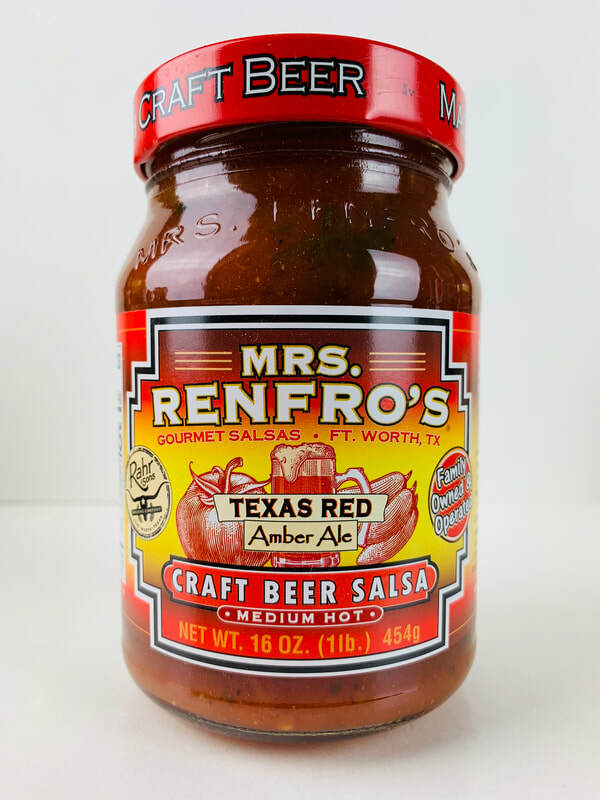 This is a different style of salsa for Mrs.Renfro's because This one uses the craft beer TEXAS RED AMBER ALE from RAHR & SONS. 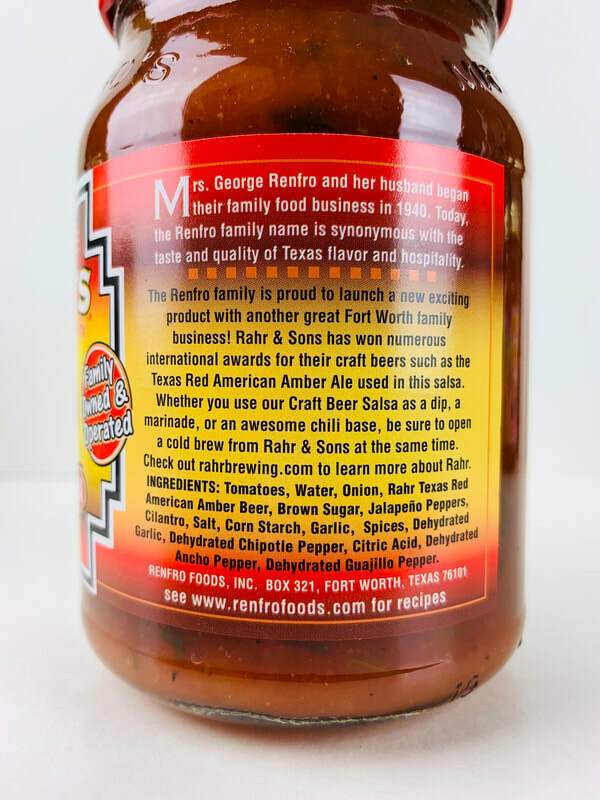 The addition of the Amber Red adds a smooth and subtle hops flavor that mixes with the tomatoes, onions, jalapeños, cilantro, salt, garlic spices and chipotle peppers wonderfully. The chipotle peppers adds a slight Smokey flavoring that make this salsa come alive with every bite. Not only is this salsa a great chip dip, it would make an excellent marinade, pour it on your tacos, eggs, nachos, hamburgers and so much more. 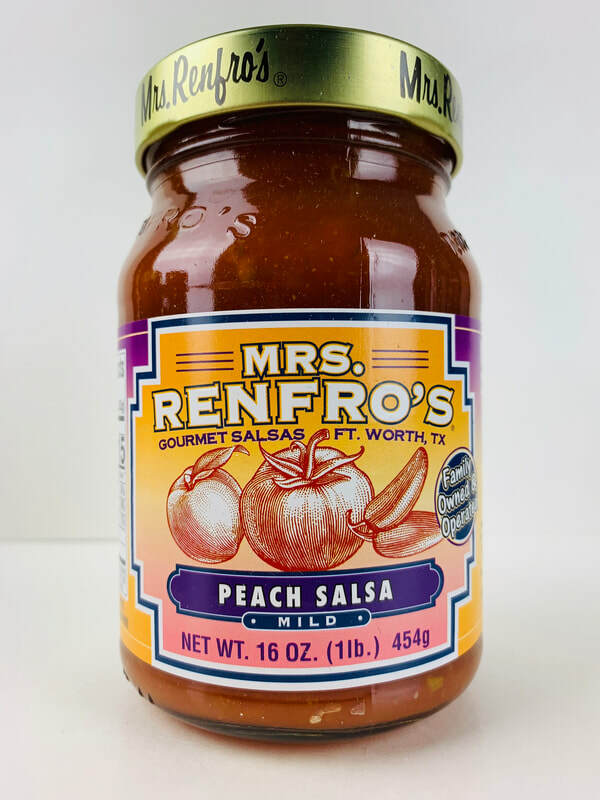 PEACH SALSA from MRS.RENFRO'S.. ​ This is a totally different type of peach salsa. It comes on rich in tomato followed by the taste of cumin. (If your looking for a super sweet peach flavor, this is not the salsa for you) Once again with crunchy vegetables added through out the jar, there is a hint of pineapple juice, brown sugar, sweet green peppers, onions, jalapeño peppers, cilantro plus garlic, pear juice concentrate and spices. All the flavors totally took me by surprise, because its so different and complexed. You can actually taste every ingredients as you enjoy its flavor. 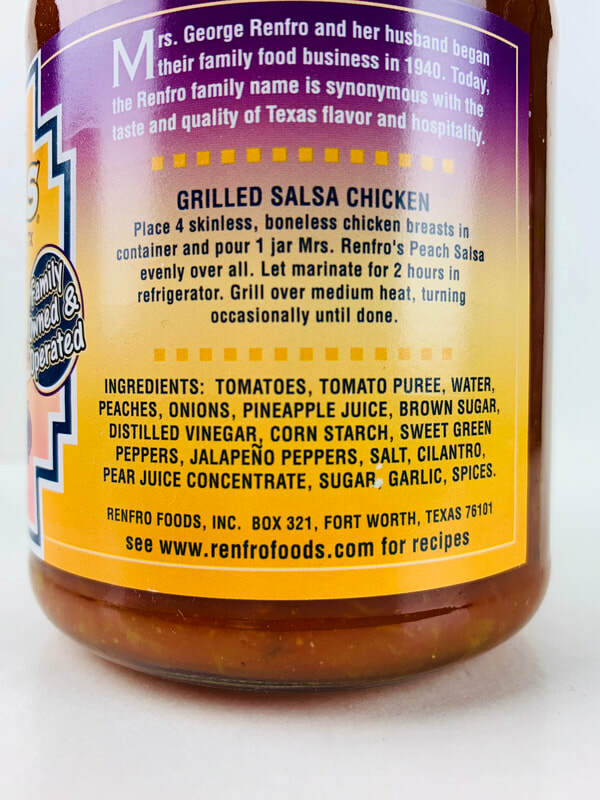 The jar has a grilled chicken salsa recipe that sounds wonderful to try, this would make a fantastic meal for sure. So grab some chips and dig in, cook and create your own masterpiece with this rich tasting peach salsa.